Mouse spleen contains three distinct mature dendritic cell (DC) populations (CD4+8−, CD4−8−, and CD4−8+) which retain a capacity to take up particulate and soluble Ags. Although the three splenic DC subtypes showed similar uptake of injected soluble OVA, they differed markedly in their capacity to present this Ag and activate proliferation in OVA-specific CD4 or CD8 T cells. For class II MHC-restricted presentation to CD4 T cells, the CD8− DC subtypes were more efficient, but for class I MHC-restricted presentation to CD8 T cells, the CD8+ DC subtype was far more effective. This differential persisted when the DC were activated with LPS. The CD8+ DC are therefore specialized for in vivo cross-presentation of exogenous soluble Ags into the class I MHC presentation pathway. Dendritic cells (DC)3 are APCs, which collect Ags, transport them to lymphoid organs, and there present the processed Ags to T cells (1, 2, 3). Despite a common ability to activate T cells, DC are heterogeneous and differ in surface phenotype, developmental origin, and detailed function. In mouse spleen, three subtypes of DC may be distinguished, namely CD4+8−DEC-205−CD11b+, CD4−8−DEC-205−CD11b+, and CD4−8+DEC-205+CD11b− (4). These three subtypes express on their surface similar levels of costimulatory molecules and of class I and II MHC molecules. The CD8+ DC are generally located in the T cell areas of the spleen, whereas the CD8− DC are generally located in the marginal zones; injection of LPS induces a shift of all DC to the T cell areas (5). These three splenic DC subtypes derive from separate developmental streams (6). They differ in the cytokines that they themselves produce (7, 8, 9, 10) and in the cytokine responses that they induce in the T cells they activate (7, 8, 11, 12, 13). Different DC subtypes may therefore influence both the intensity and the nature of immune responses. Accordingly, we asked whether these functional differences are linked to the Ags that the different DC subtypes collect or to the way they are processed. To be recognized by T cells, protein Ags must be reduced to small peptides and presented either on MHC class II for activation of CD4 T cells or on MHC class I for activation of CD8 T cells. Exogenous Ags are normally processed and presented on class II MHC. By contrast the Ags presented on class I MHC are generally of endogenous origin. In some circumstances, however, exogenous Ags can enter the class I MHC presentation pathway of APC and thereby prime CD8 T cells, a process generally termed “cross-presentation.” This was originally reported for cell-associated Ags (14, 15, 16, 17, 18), but a similar entry of exogenous Ag into the class I MHC pathway has also been described for soluble Ags (19, 20, 21). DC are effective at cross-presentation in vitro, which may be linked to their efficient uptake of apoptotic cells (21, 22, 23, 24, 25, 26, 27). In a recent study using OVA injected in a cell-associated form, the CD8+ DC, but not the CD8− DC, were able to cross-prime CD8 T cells and induce a CTL response (28). We have shown that all three DC subtypes in spleen show rapid uptake of injected fluorescent latex beads, a capacity retained after LPS injection, which causes further DC maturation (6). We now extend this to show that all three splenic DC subtypes take up soluble OVA in vivo. However, we find that the final ability of these DC to present this Ag to OVA-specific T cells differs markedly. 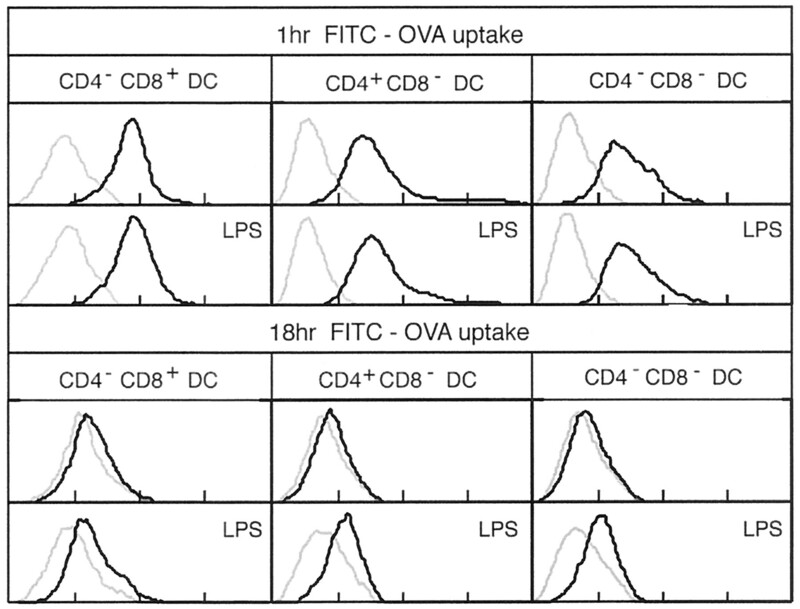 The CD8− subsets show the greatest ability to stimulate OVA-specific MHC class II-restricted CD4 T cells, whereas the CD8+ DC are much more efficient at presenting OVA and stimulating MHC class I-restricted CD8 T cells. The source of DC was 6- to 8-wk-old female C57BL/6J Wehi mice, bred under specific pathogen-free conditions. The source of the CD8 T cells was 6- to 12-wk-old OVA-specific, Rag-1-deficient, class I MHC-restricted TCR-transgenic mice (OT-I mice) (29). The source of CD4 T cells was 6- to 12-wk-old OVA-specific, class II MHC-restricted, TCR-transgenic mice (OT-II mice) (30). OVA containing <0.4 pg endotoxin per mg was obtained from Calbiochem-Novabiochem (La Jolla, CA). For uptake studies, OVA was conjugated to FITC (Molecular Probes, Eugene, OR) at a ratio of 7 fluorochromes per protein molecule. LPS, from Escherichia coli serotype 0127:B8, was obtained from Sigma Chemical (St. Louis, MO). OVA was normally injected i.v., at 3 mg/mouse. When used, LPS was normally injected i.v., at 30 μg/mouse. For experiments on fluorescent Ag uptake, nonfluorescent native OVA was injected into control mice to provide the DC background for FITC labeling. For assessment of Ag presentation by T cell proliferation assays, the saline solvent alone was injected into control mice to provide DC for the background response of T cells to DC in the absence of OVA. The procedure was as described in detail elsewhere (4, 6) and involved brief collagenase digestion of spleen fragments, selection of light density cells, and then immunomagnetic bead depletion of non-DC. This preparation, 80% pure, was then used for immunofluorescent labeling before positive sorting or analysis. The mAb, the fluorescent conjugates, and the labeling procedures have been specified previously (4, 31, 32). To identify DC, the pan-DC markers used were either high levels of class II MHC (for the experiments tracking FITC-labeled Ags) or CD11c (for experiments on Ag presentation in culture). Anti-CD11c (N418) was used as a Cy5 or a FITC conjugate. Anti-class II MHC (N22) was used as a Cy5 conjugate (Amersham Pharmacia Biotech, Little Chalfont, Buckinghamshire, U.K.). The markers used to separate the spleen DC subpopulations were CD8α and CD4. Anti-CD8α (YTS169.4) and anti-CD4 (GK1.5) were used as FITC, PE, Cy5, or Alexa 594 conjugates. Propidium iodide Alexa 594 (Molecular Probes, Eugene, OR) was included in the final wash to label dead cells. Analysis of DC showing uptake of fluorescent Ags was performed on a FACStarPlus instrument (Becton Dickinson, San Jose, CA). The class II MHC or CD11c markers, the light scatter gates, and the propidium iodide exclusion gate were set to select for viable DC. The three spleen DC populations were then gated using CD4 and CD8 markers, as described elsewhere (4, 6), and the FITC fluorescence due to uptake of labeled Ags was analyzed. The background was a similarly immunofluorescent labeled, parallel DC preparation from mice that had been injected with nonfluorescent OVA. Sorting of DC for T cell activation assays after native Ag injection was performed on a MoFlo instrument (Cytomation, Fort Collins, CO), using similar parameters. In this case, DC used for background proliferation in the absence of OVA were isolated in parallel from mice in which saline alone was injected instead of the solution containing OVA. T cells were isolated by immunomagnetic bead depletion of lymph node cells from OT-I mice (for CD8 T cells) or OT-II mice (for CD4 T cells). The lymph node cells were depleted using anti-B220 (RA3-6B2), anti-GR-1 (RB6-8C5), anti-erythrocyte (TER-119), anti-Mac-1 (M1/70), and either anti-CD4 (GK1.5) for CD8 T cell preparations or anti-CD8α (53-6.7) for CD4 T cell preparations. Purified OVA-specific CD4 or CD8 T cells (10,000) were cultured together with DC (0–3,000) from OVA-injected mice, or as a background control with DC from saline-injected mice. Replicate cultures were in 200 μl medium in the V-bottom wells of 96-well culture trays. The culture medium was modified RPMI 1640 containing 10% FCS (11) and containing 50 U/ml murine IL-2 (Boehringer-Mannheim, Mannheim, Germany). Culture was normally for 3 days at 37°C in a humidified 10% CO2-in-air incubator. The cultures were then pulsed with [3H]thymidine (1 μCi/well) for 8 h, harvested onto glass fiber filters, and incorporation into cellular DNA was measured by liquid scintillation counting. To determine whether all three splenic DC subsets were able to access and take up soluble protein, mice were injected i.v. with FITC-conjugated OVA. The DC were isolated and immunofluorescent labeled for DC markers; then the level of FITC fluorescence within the DC was assessed. The background control was DC isolated in parallel from mice injected with equivalent levels of native, nonconjugated OVA. The extent of uptake of FITC-OVA is shown in Fig. 1⇓. Similar results were obtained with FITC conjugated to human γ-globulin. Ag uptake and retention by splenic DC subtypes. Mice were injected i.v. with 3 mg FITC-conjugated OVA (heavy line), or as a background control, unconjugated OVA (gray line); then DC were isolated from pools of eight spleens, immunofluorescent stained, and analyzed by flow cytometry 1 or 18 h later. In the lower panels, the DC were isolated from mice that had received LPS i.v. 1 h before the OVA. The results show the FITC fluorescence for the gated DC subtypes on a 4-decade log scale. The small shift in FITC fluorescence above the background seen at 18 h was consistent and had disappeared completely by 2 days. Results are from a single experiment representative of two with FITC-OVA injection. Within 1 h of injection, all three spleen DC subtypes showed extensive uptake of OVA. The mean level of FITC fluorescence per DC was a little higher for CD4−8+ DC, possibly because these cells are a little larger. This agrees with our earlier studies showing that all three splenic DC subtypes were able to take up fluorescent latex beads (6). Most of this FITC fluorescence was lost by 18 h, presumably by digestion of the protein, a result that differs from the persistence in the DC of the nondigestible latex beads (6). However, a low level of fluorescence above the control background was always seen in all DC subtypes at 18 h, suggesting that some of the Ag persisted. No such fluorescence was seen with splenic T cells. Administration of LPS activates and matures DC and induces a shift into the T cell areas of spleen (5). To determine whether the handling of Ags differed under these conditions, LPS was injected into mice 1 h before the FITC-OVA. As shown in Fig. 1⇑, this did not change the initial uptake, but it increased the FITC fluorescence remaining in all DC subtypes at 18 h. This may have reflected an increase in the size of the DC after LPS stimulation. Again this result is in line with our previous findings that splenic DC retain a capacity to take up foreign material even after LPS-induced maturation (6). There did not appear to be major differences between the three spleen DC subtypes in uptake or retention of injected soluble protein Ags. To determine whether the three DC subtypes were also equivalent in their ability to process and present Ag to T cells, mice were injected with the same amount of OVA (not FITC conjugated), and 18 h later the DC subtypes were isolated. Their ability to initiate proliferation of OVA-specific T cells in culture was then assessed using a thymidine uptake assay. To ensure an appropriate proliferation background, DC from control mice not injected with OVA were isolated, sorted, and assayed in parallel. The cultures contained exogenous IL-2. This was essential to obtain a strong proliferative response. It also ensured that Ag presentation and initiation of T cell proliferation was the limiting parameter measured, rather than the maintenance of proliferation according to the level of endogenous T cell IL-2 production, because we have demonstrated elsewhere that DC subsets differentially regulate the quantity of IL-2 produced by the T cells they activate (11, 12). Using this approach, the presentation of exogenous soluble Ag to class II MHC-restricted CD4 T cells from OT-II mice was directly compared with the “cross-presentation” to class I MHC-restricted CD8 T cells from OT-I mice, using the same DC preparations in side-by-side assays. The results are presented in Fig. 2⇓. Differential presentation of Ag to Ag-specific CD8 or CD4 T cells by spleen DC subtypes. Mice were injected i.v. with 3 mg native OVA or with PBS only to provide the Ag-free background response (BG), and the DC subsets from pools of eight spleens were isolated and sorted 18 h later. The isolated DC subtypes were then cultured with 10,000 OVA-specific T cells, either CD8 T cells from OT-I mice or CD4 T cells from OT-II mice. The culture medium contained murine recombinant IL-2 (50 U/ml). Three days later, the cultures were pulsed with [3H]TdR, and the incorporation into cellular DNA was determined. The background proliferative responses of the T cells to the individual DC subtypes from mice not receiving OVA were measured separately in each experiment, but because they were always low and not distinguishable, they have been pooled as a single no-Ag background response. The responses by T cells alone or DC alone were always below this background. The upper panels show the differential responses induced by DC from mice injected with OVA alone; the lower panels show the responses induced by DC from mice that received LPS i.v. along with the OVA injection. 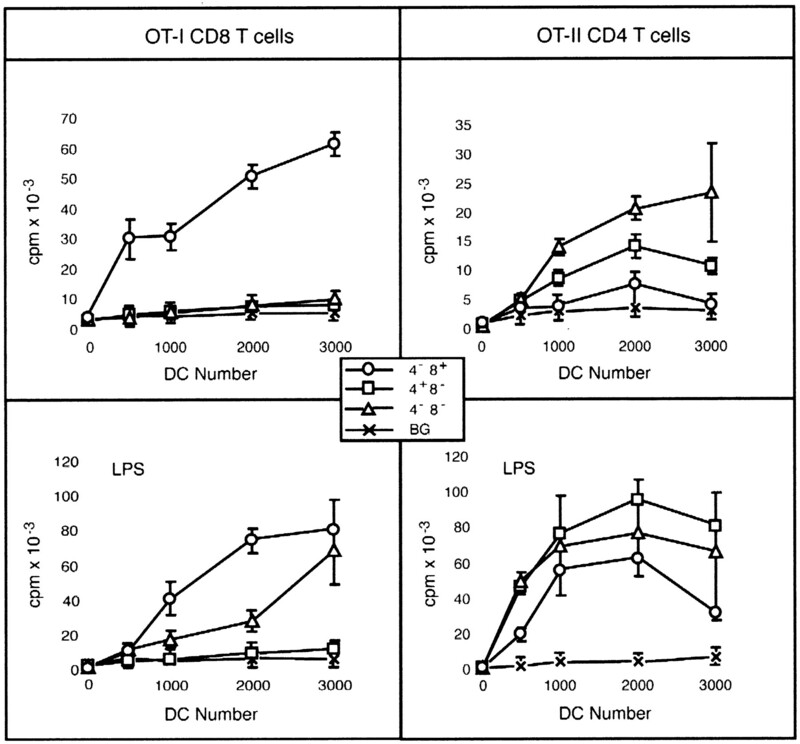 The same DC preparations were used for side-by-side cultures with OT-I-derived CD8 T cells or OT-II-derived CD4 T cells. Three to five replicate cultures were used for each point in each experiment. Upper panels, Pooled data (±SEM) from five separate experiments on OVA-injected mice; lower panels, pooled data (±SEM) of two separate experiments on LPS plus OVA-injected mice. Each individual experiment gave the same overall results as represented by the pooled data. ○, Responses to CD4−8+ DC; □, responses to CD4+8− DC; ▵, responses to CD4−8− DC; ×, pooled background responses to DC from mice not injected with OVA. Effective stimulation of class I MHC-restricted CD8 T cells was obtained only with the CD8+ DC from spleen. In contrast, effective stimulation of class II MHC-restricted CD4 T cells was obtained only with the CD8− DC, with the CD4−8− subset being the most efficient; only marginal responses were obtained with CD4−8+ DC. The result was consistent over six similar experiments, and the results were comparable whether the proliferation readout was after 2 or 3 days of culture. It was important to check whether this differential in Ag presentation was maintained on further DC maturation and movement to the splenic T cell zones. Administration of LPS with the Ag enhanced the stimulatory capacity of the DC, especially the capacity to stimulate CD4 T cells (Fig. 2⇑). This was in line with the enhanced retention of Ag in the DC (Fig. 1⇑). The basic results for the differential Ag-presenting functions persisted after LPS treatment, the CD8+ DC remaining much more efficient at presenting OVA to the class I MHC-restricted CD8 T cells, whereas the CD8− DC remained more effective at presenting OVA to CD4 T cells. However, after LPS treatment, the CD4−8− DC displayed some ability to stimulate CD8 T cells, whereas the CD8+ DC now gave significant stimulation of CD4 T cells. In addition, in some but not all experiments, the CD4+8− DC rather than the CD4−8− DC were now the most effective stimulators of CD4 T cells. Results were similar when 6 μg rather than 30 μg LPS were administered. When the Ag dose was reduced to 0.3 mg OVA per mouse, proliferation of T cells was marginal unless LPS was also administered, but then gave the same differential response, with CD8+ DC priming CD8 T cells, but CD8− DC priming CD4 T cells. Overall, LPS stimulation did alter somewhat the ability of DC to present and cross-present soluble Ag, suggesting that bacterial infections could modify Ag presentation capacity. However, LPS-induced maturation did not alter the relative preference for class I MHC presentation by CD8+ DC, and class II MHC presentation by CD8− DC, suggesting these are specialized functions of the DC sublineages, rather than reflecting differences in activation state. These results for processing of soluble Ag in vivo are therefore in concordance with the recent results of den Haan et al. (28) for cell-associated Ag, in indicating that CD8+ DC are specialized for cross-presentation of Ags and their processing into the class I MHC restriction pathway. In many respects, the present results are clearer, because much lower numbers of DC were sufficient to stimulate the OVA-specific T cells; this makes it less likely that our injected soluble OVA gained access to the cross-presentation pathway by becoming cell bound. In our experiments, the selfsame DC subset preparations could be shown to have opposite effects on the OVA-specific CD8 or CD4 T cells, thus providing an internal control that the differences were at the level of class I MHC vs class II MHC presentation. In addition, the response of allogeneic T cells to these different DC subtypes does not display these marked differences (11, 12), suggesting that the differential we now observe in T cell activation is not dependent on some specialized costimulatory molecules on the different DC. Whether these striking differences in DC Ag presentation in vivo are the result of complex, multicell phenomena or represent a fundamental difference in the biochemistry of Ag processing by individual DC subtypes remains to be established. ↵1 This work was supported by the National Health and Medical Research Council (Australia). 3 Abbreviation used in this paper: DC, dendritic cells.